La meilleure machine a sous des casinos en ligne. I casinò online con i più alti bonus senza deposito. Retro2Ride.com is the web's source for classic vintage, novelty, and custom cycling apparel for men and women. From creative, unique cycling jerseys to elegant and casual bike clothing, Retro2Ride.com carries a vibrant collection of cycling apparel that you won't find anywhere else. Explore various Design Collections ranging from vintage and classic cycling jerseys to cannabis and beer cycling jerseys that embody specific themes. The men's and women's cycling jersey from Retro2Ride.com deliver stunning graphic illustrations that capture bold pop culture icons, social movements, earthy and astronomical undertones, and historical figures. But unlike other sources of novelty cycling jerseys, Retro2Ride.com doesn't sacrifice performance in its products. Using premium quality materials constructed for optimal moisture-wicking breathability and comfort, Retro2Ride.com continues to innovate by combining signature graphics and iconic imagery with truly functional, durable cycling jerseys. Cycling is gaining global popularity for a number of reasons. Whether you’re in it for competition or to reduce your carbon footprint, you’re sure to gain an incredible workout in the process. At the same time, you’re part of a movement spanning 60 million people in America, and the number continues to climb. When it comes to the cycling community, the incredible sense of fellowship alone is enough to keep you motivated to reach for new heights. Though your goals may not be the same as fellow cyclists, everyone has common hurdles to face and milestones to celebrate. What you wear for the ride is part of the overall experience, and as you may have learned on your own or through other members of the community, not all clothing is created equal. At Retro 2 Ride, we specialize in offering unequalled options. Why Choose Clothing Designed Specifically for Cycling? While there’s no set-in-stone rule dictating how you should dress for a ride, most of us learn the hard way what not to wear. Though off-the-rack workout attire helps reduce some of the common clothing conundrums, its design is too general to cater to the needs of dedicated cyclers. As is the case with our leather clad counterparts, wardrobe serves a far greater purpose than simply looking the part. Perhaps the most important element of your gear is a well-fitting helmet, but it’s only the tip of the iceberg. Your eyes need to be safeguarded just as much as your skull and the valuable materials within. Sports sunglasses offering UV protection, shielding against the wind and shatter resistance in the event of solid material barrages should be high on your list of priorities. Comfortable shoes with stiff soles and the right pair of cleats for your bike play a role in your overall performance as well as safety. Of course, even the best cycling shoes on the market can’t live up to their expectations without high-quality athletic socks between them and your feet. Although gloves are traditionally associated with colder weather, they come in handy regardless of the temperatures when biking. Aside from Cushioning your hands, they create a barrier against slippery, sweaty palms and provide a better grip. Despite being designed to fit snugly, bike shorts offer cyclists a comfortable alternative to battling blisters from unseemly seams and constant tugging at traditional pants to keep them in their proper place. They’re also equipped with strategically placed padding for optimum functionality. Having at least a couple pairs of basic black shorts in your cycling wardrobe is a must. This brings us to bike jerseys. Available in long-sleeve, short-sleeve and sleeveless varieties, these distinctively designed shirts outshine your average tee or tank top from a number of angles. They offer benefits with which even standard exercise attire can’t compare. • Fitting for the Occasion: Riding in a t-shirt tends to go one of two ways: it ultimately bunches up in the vicinity of your armpits or forms a not-so-accommodating parachute at your back. In some cases, both are true; either way, they’ll hold you back both literally and figuratively. From generating unnecessary drag to creating skin irritation, they’re not right for dedicated riders. Though cycling jerseys are available in tight or relatively loose options, both are form fitting, so they don’t ride up or billow in the breeze. • Made for the Ride: Unlike standard exercise garments, bike jerseys are cut specifically for cyclists. Built-in broader shoulders conform to your shape while giving you extra room to move when assuming the cycling stance. Sleeves, if applicable, are also tailored to the arms-forward position, so they don’t work against you. • Trimmed to Perfection: Conventional tops have a way of sagging in the front and riding up in the back when you’re not standing or sitting perfectly straight. Designers kept this in mind when tailoring both women’s and men’s cycling jerseys. They’re made slightly shorter in front but longer in the back, so you don’t have to worry about exposure to undue hazards or being exposed altogether. • Stay Cool Under Pressure: Physical activity generates a generous amount of body heat. Since jerseys for cyclists are composed of breathable fabrics, they allow for better airflow than street clothes. • Don’t Sweat it: You’re bound to sweat no matter how cool the weather is when you ride. Whereas conventional clothing soaks up moisture and clings to you when wet, bike jerseys wick sweat away from your skin and send it outward to evaporate. You’ll stay dry and have less odor to deal with regardless of how vigorous the ride happens to be. • Be Prepared for Anything: As a general rule, you need to pack as light as possible when taking to the bike. Extra bulk slows you down and has the potential to negatively impact your balance. That being said, certain essentials need to come along for the ride. Cycling jerseys come equipped with extra pockets to hold anything from wallets to water bottles. This storage space is built into the back where it’s out of the way, but it’s still easily accessible. At the same time, everything is secure, so it doesn’t flop around and throw you off-kilter. • Keep Safety on Your Side: When you’re battling traffic on a bike, the last thing you want is to blend in with your surroundings. Jerseys come in bright colors for better visibility. Some incorporate reflectivity into their designs for foggy and nighttime journeys. While all riding gear and clothing are designed to boost safety and enhance the ride, bike jerseys are integral components in the overall experience. You’ll find an array of options during your search for the right ones, but not all of them are going to speak to your unique style and personality. At Retro2Ride.com, we incorporate the individuality aspect as well as all the built-in safety and functionality features. Being seen by motorists is certainly an important factor among the cycling community, and all the major brands take this into consideration when designing their clothing. Of course, the result is generally a vibrant cookie-cutter effect. 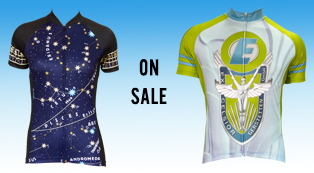 We bring you a selection of more unique options in men’s and women’s cycling jerseys. In our classic and vintage cycling jersey lineup, you’ll find designs not available through standard vendors. From paying homage to the nation’s past to honoring the history of cycling itself, we give you options above and beyond the norm. Check out our collections of designs to see how we can help set you apart from your fellow cyclists. • Black Cat: Inspired by the globally known Black Cat Fireworks Company, this cycling jersey offered in both men’s and women’s sizes draws you to the 1940’s in America’s timeline but even further back in world history. Spark your determination and bring good fortune to any ride with a concept originating in a country well-known for transforming early weapons technology into a renowned celebratory staple. • Smokey Bear: Available in vivid orange, our Smokey Bear men’s bike jersey displays one of nature’s most recognized and respected advocates as well as the message he so adamantly delivers on behalf of the United States Forest Service. • Circus: A tribute to one of the nation’s biggest circus acts of the late 1800’s and early 1900’s, the men’s circus jersey offers a peek into a much-anticipated form of entertainment long before smartphones took over the world. • Cataluña: Despite World War II raging on in all its fury, Spain continued its time-honored tradition of bicycle racing. This particular men’s vintage jersey honors the 1943 Tour of Catalonia with a replication of the event’s original official poster. We also offer a version marking the 1952 race in all its glory. • 1935 World Championship: From the 9th Annual World Cycling Championship, this option displays a cyclist of the era along with flags representing all the countries competing in Belgium for the 1935 title. • Gumby: Also available in men’s and women’s versions, the Gumby cycling jersey memorializes one of our nation’s beloved Claymation characters from throughout the 1950’s. A brilliant yellow background maximizes visibility while Gumby in lone fashion graces the front of the shirt. On the back is a depiction of the famous figure with his faithful steed, Pokey. • NASA: Emblazoned with a globally recognized earmark, this item honors the Space Age as well as the 1958 founding of the National Aeronautics and Space Administration itself. Wear an element of history as you cycle into the future. • Paris-Roubaix: Celebrate history’s French professional cycling team known for demonstrating its skill and endurance time after time in the Tour de France during its half-century ride to fame. Though this is one of the more subdued members of our lineup, it still draws its fair share of attention. Ladies of the cycling movement, or guys looking for the perfect gift, may want to check out our selection of women’s bike jerseys. We’ve got attitude, flair and skill from the past and present depicted through modern style. From vintage to visionary, you’re sure to find something matching your uniqueness. • Bad Cat: Black with yellow accents and white paw prints, this find comes complete with the universal black-and-white likeness whose Cheshire smile is said to be the embodiment of the Bad Cat state of mind. • Chat Noir: Entertainment of Paris’s 19th century scene receives due recognition through our rebirth of the original Le Chat Noire poster created by Salis just one year before the famed cabaret saw the end of its reign. • Ride Pink: Raise breast cancer awareness, support survivors and honor the memories of victims with our Ride Pink women’s cycling jersey. We pass 10 percent of its sales along to the Breast Cancer Research Foundation to aid in the quest for a cure. • Red Rose: Available exclusively from Retro2Ride.com, this multi-faceted rose print jersey represents grace, love and a passion for the world of cycling. • Balloon: Bring a cool and festive vibe to your group or lone rides with our sleeveless hot air balloon print. • Abalone: Muted and elegant hues of purple, blue and green meld together in this short-sleeved jersey highlighted by basic black and white. • Monarch: Vibrant orange hues of the monarch’s wings set you apart in this butterfly-themed option. Carry the free spirit of the monarch as well as its famed beauty wherever the ride takes you in this women’s bike jersey, another design exclusive to the Retro2Ride name. • Rosie the Riveter: During World War II when a considerable portion of America’s male workforce was on the front lines, women stepped up to fill the nation’s job vacancies in factories, shipyards and other largely male-run settings. Rosie the Riveter became not only an icon of the times, but a general embodiment of physical, mental and emotional strength. We honor all she represents through our complete Rosie the Riveter line, including long-sleeve, short-sleeve and sleeveless jerseys, tanks, tees, shorts and caps. • The Monthly Cycle: As the official jersey of the St. Louis-based women’s riding and advocacy group, 10 percent of sales from this women’s cycling jersey is forwarded to The Monthly Cycle. We also offer a matching cap. These are only a few of the option we offer. Browse our website to see our full range of cycling jerseys. From vintage and classic to modern and novelty designs, we help take your riding wardrobe to the next level. America’s beer industry dates as far back as the 1600’s. Since then, surging popularity and influence from a number of different cultures have led to a massive evolution in this realm. Our brewery-inspired collection celebrates this time-honored tradition. • Corona/Modelo/Pacifico: Corona beer’s history begins in 1922 when Grupo Modelo was formed. In 1925 the first production run of Corona was bottled and within a decade it had become the top selling beer in Mexico. The smooth texture and refreshing taste of Corona beer, along with its associated laid back beach vacation lifestyle, have made it the top selling Mexican beer around the world, with exports to over 150 countries. 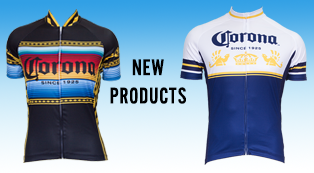 We carry four distinct Corona jerseys and a Modelo jersey for both men and women. • Penn Brewery: Penn Brewery is a brewery and restaurant in Pittsburgh, Pennsylvania. It was founded by Tom Pastorius in 1986 on the site of the former Eberhardt and Ober Brewery (founded in 1848). Penn Brewery brewed its flagship product at other breweries until 1989. Known as Penn Pilsner, Pastorius brewed the full bodied German-syle beer in strict accordance to the German Purity Law (Reinheitsgebot) of 1516. Pastorius also recognized the demand for authentic German cuisine in his hometown of Pittsburgh, Pennsylvania, spawning the idea of a brewery and restaurant under one roof. We produce Penn Brewery cycling jerseys exclusively for the brewery’s gift shop. • Schlafly: Established in 1986, the Schlafly brand has swelled beyond the borders of its St. Louis home. We offer you a full range of men’s and women’s jerseys paying homage to the company’s American Pale Ale, Kolsch, Hefeweizen and its India Pale Ale. • Penticolas Brewery: Since their founding in late 2011, Peticolas has demonstrated a commitment to quality and consistency that has placed them in the conversation for best craft brewery in Dallas. Michael Peticolas, who inherited a passion for craft beer from his mother, a homebrewer herself, is the brewery’s founder. Following in his mother’s footsteps, Michael has become not only a creator of beloved brews, but an ambassador and advocate for Texas’ burgeoning craft beer industry. We produce Penn Brewery cycling jerseys exclusively for the brewery’s cycling team. Advertise your favorite brew while you take to the streets and trails. Our nation’s beer-bound history began with unique home-brewed options. Though it grew to massive status over the centuries, it’s drifting back to its small-batch roots. Our brewery collection pays homage to those local handcrafted favorites gaining national and international acclaim. Over the past 15 years, Retro has worked with craft breweries too numerous to mention in full. Just to name a few, however, Retro has worked with Anchor Steam, Coney Island, Flying Bison, Hopworks, Lucky Lab, Maui, Schmalz and Victory breweries. Plenty of entrepreneurs have taken a notion to follow suit with America’s beer crafters. Many have tried and failed, but a few have actually succeeded in taking matters up a notch despite chronic market conditions. Check out The High Road collection to celebrate some of your favorite lesser-known artisans. Aside from our high-vis designs and all the features common to cycling gear, we add a few extra touches to our cycling jerseys. All are made of state-of-the-art Euro-Mesh fabric for maximum comfort. They feature Airpass Pro+ wicking technology to keep you dry no matter how much you sweat. Airthrough mesh side panels give you added breathability and optimum flexibility. Hidden built-in zippers allow for adjustability based on outdoor conditions, and our jerseys are equipped with the YKK brand known internationally for its durability. We’ve added a silicon gripper band for greater staying power and use dye-sublimation printing processes to ensure your colors remain vibrant in spite of the wear you put them through. On top of all that, we incorporate SPF 30 or greater to block out up to 97 percent of the harmful UV rays you’re bound to encounter. Cyclists may all dress in similar fashion with the goals of being safe, comfortable and visible in mind, but you don’t have to follow the crowd in every aspect. We offer a wide selection of cycling jerseys designed for the ride, but we strive to stray from the norm. Our distinctive collections give you the power to keep your mind on your journey rather than common distractions. You don’t have to sacrifice your own personal style to gain all the benefits of biking attire; in fact, we incorporate a few unexpected features along with the industry standard. Stay cool and dry, forego fighting to keep an ordinary shirt in place, bypass the dangers of UV exposure and enjoy riding in a shirt designed to work with you rather than against you. 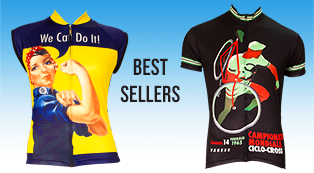 All the while, display your own unparalleled personality through our unique classic, vintage, modern and novelty cycling jerseys for men and women. Browse our website, and let us take you back in time or propel you into the future.